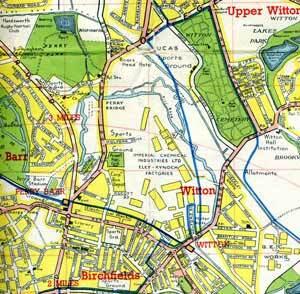 Kynoch Works at Witton was during WW2 still a major Imperial Chemicals Industries Ltd. site responsible for many of ICI's metals interests. This large organisation was heavily involved in the production of semi-fabricated non-ferrous metals, ammunition and many other products for the war effort both on this site and on many others in the Midlands and elsewhere. 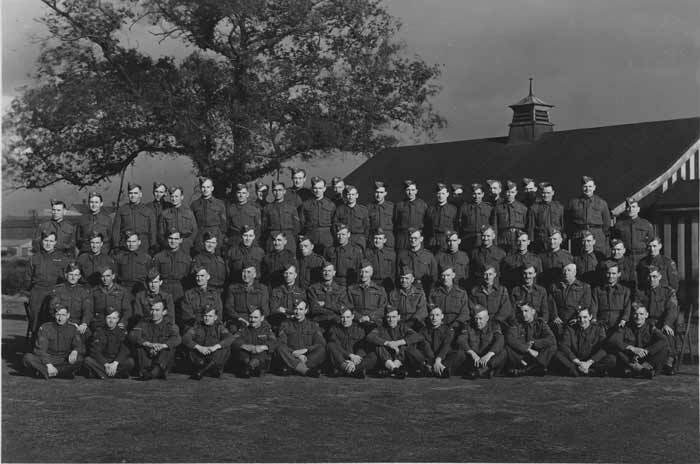 The size (click on image to the right to magnify) and the strategic importance of Kynoch fully justified the establishment of a large factory Home Guard unit from mid-1940. It came to be designated "B" Company of the 46th Warwickshire (Birmingham) Battalion which otherwise had a general responsibility for areas of Handsworth. This is a list of the officers of "B" Coy. as at stand-down in December 1944 (left). And below is a picture of Officers and NCOs of the Kynoch unit, dating from 1944. By that time some of the original members of the unit had been transferred to duties with anti-aircraft rocket batteries in the area, at least one of which was located in Walmley. If any visitor can identify any more of the personnel, or provide further information about the unit's activities, this would be greatly appreciated by the Webmaster. A few of the above men have to date been identified. In the second row, seated, and third from left to right, is Lt. R. "Bob" King. At 6th from l. to r. is Lt. Ernest Edwin Long. Sitting beside Lt. Long, at 7th, is Capt. H.O. Smaldon and then next to him Major H. Cann. Major Cann was the C.O. of the Kynoch Company and Capt. Smaldon his 2 i/c. Major Cann was probably employed in Witton's Labour Department. Next along the row from Major Cann, at 9th from the left, is Lt. W. Parry. At the extreme right of the row is Sgt. Albert George Harper. In the fourth row, 11th (out of 15) from the right, is Reg Harper, brother of Sgt. Harper. Both brothers worked in the Engineering Workshops. One of few other men who are known to have belonged to the Kynoch unit was Pte. Peter J. Allen (1921-2006). After initial service on the Witton site he was transferred to AA rocket battery duties at Walmley. Another member was Miss Christine Smaldon, the daughter of Capt. Smaldon and it is to her that we are indebted for the following memories. She joined the Women's Section and, she recalls, had a uniform and even one stripe. Like most female members she was engaged on non-combative activities, such as typing reports and so on. At that time she was working for Gladys Clarke, Women's Staff Officer who, it is thought, organised the Witton HG Women's Section together with Linda Holloway. Lt. Walter Parry (d. 1967) joined the unit as a lieutenant after service in the Norwegian campaign with the Shropshire Light Infantry. He is described as being responsible for training and administration and may well therefore have been the unit's adjutant, drafted in by the Army and not therefore an employee at that time. His official function was "Quartermaster". At the cessation of hostilities, however, he joined No. 5 Labour Office. His motto, well known to his comrades and colleagues, was "Example is the soul of British discipline". After the Home Guard stand-down in December 1944 the Home Guard and Ex-Service Association was formed on the Witton site and survived for many years. Walter Parry succeeded Mr. Harry Tyler as Secretary and served in that capacity for the rest of the Association's life. Mr. A.G. Harper was a Chairman of the Association; he and Mr. Parry had been members of the Works Home Guard unit and thus comrades of Lt. H. Tyler. Grateful acknowledgement: to Gerry Long for the information about Lt. Long, the group image and the officers' list; to CH for memories; to the late Nora (Thomas) Myers for other information and identifications; to Alan Harper for other identifications; and to the publishers of "Metals Monitor".